A few weeks ago, our Chief Strategy Officer, JT Bricker, outlined our framework for customer marketing. In this post, a companion piece, I take that overarching strategy and expand on the customer lifecycle process. As you can see in the below imagine, lifecycle is but the first focus area in a great customer marketing process, but also likely the most important. Per JT’s post, I will assume you’ve already aligned on the strategic initiatives of your business, which align to your marketing department goals (if not, read JT’s post here that explains how to do this) and that finally, you’ve aligned how customer marketing fits into those marketing department goals. With those caveats out of the way, let’s dig in! What is a Customer Lifecycle? The word “lifecycle” in marketing refers to the journey a person takes when getting to know your company, product or service. From becoming aware of you through becoming a customer, the lifecycle outlines different stages. Specifying these stages helps align organizations across different departments for goals and ownership. Often, especially in B2B marketing, the “lifecycle” only refers to the lead lifecycle. That is, what actions does a person take on their journey to becoming a customer? As you’ll see below, in our customer lifecycle diagram, the lead process (on the top) is only half the battle. Once someone becomes a customer, retention and loyalty tactics come into play. If you looked at the above diagram and got a sinking feeling in your stomach, because you know you’re missing customer lifecycle stages in your general lifecycle, fear not! Most people we work with stop at Closed Won. But you don’t want to be like “most people”, right? You want to be better! And so, how can you augment your existing lifecycle to include customer lifecycle marketing stages? To start with, we’re going to need to understand what happens to a person when they become a customer. And to gather that understanding, we’re going to need some meetings. NO, NOT THE DREADED “M” WORD!! Yes, meetings. Sales. Assuming your sales team still has some interaction with the customer, even if it’s simply a thank-you, we need to understand how the sales team communicates the product/service sold, what kinds of expectations they set, etc. Customer Success. From onboarding through their touchpoint cadence. The bulk of the information will come from these guys. Customer Sales. If the upsell/cross-sell of existing customers doesn’t fit into the responsibilities of either of the above roles. Customer Marketing. If you have people dedicated to advocacy, referrals, email communications, etc. Accounting. This one is commonly missed, but it’s important to understand all touchpoints into a customer. How and when they’re contacted for payment is a huge part of their overall experience with your company. Customer Support. Generally this division is separate from customer success. Support, like accounting, is an area where customers will either be overjoyed with their experiences or absolutely hate them. Keep in mind, when your customer is accessing support they are extremely vulnerable and likely in a state of extreme to mild panic. Do we have a customer onboarding phase? What is the metric for success for us? Is our customer’s metric the same? Who owns the success metric? How do we measure the success metric? What marketing touchpoints exist post-purchase? How do we identify if there is upsell or cross-sell opportunity? What do we do when we’ve identified an upsell or cross-sell opportunity? How do we track product/service usage? Do we categorize our users by usage stats? How do we market/sell/service different categories of users? The above represents a very simple example of customer lifecycle stages, along with the transitions explaining how someone moves between stages. We created this after a series of four (4) 1-hr meetings with our client. What’s this headline? Why create all this just to break it? Well, here’s the harsh truth, you can encourage breakage now, or handle a heaping pile of frustration when it breaks after you’ve launched it. It’s better to get any issues out in the open during the conceptual part of the project as much as possible. If and when they break the model, it’s okay! That’s the point. Review their examples and make the necessary adjustments with the rest of the stakeholders. Keep in mind that some of their breakage points, might be a lack of training or understanding. The beauty of this entire exercise is to get everyone on the same page. After you define the process, it’s time to leverage technology to map it and keep track of it. Among the answers you’re likely to hear during your customer lifecycle discovery sessions will be a lack of data points or definitions. The purpose of the meetings and discovery and resultant flowchart is to do away with any uncertainty. Building out your customer lifecycle in a marketing automation system (like Marketo) or CRM (like Salesforce) forces the organization to deepen its commitment to the process. It will also help you identify gaps or breakages. I am one of LeadMD’s robust bench of Marketo experts. The majority of our clients invest in Marketo. And so, it stands to reason that the system I’m most familiar with operationalizing the customer lifecycle in is … Marketo! Here are the step-by-step instructions for taking your customer lifecycle process from a LucidChart to Marketo. Marketo’s Revenue Cycle Model (RCM) is one of those features that experts and consultants harp on constantly, but few newbie Marketo users leverage. If you want a quick and dirty breakdown of Marketo’s RCM, check out Kim Para Allen’s post on it here. Let’s assume you built out your RCM, but stopped at “Customer”. The first step in operationalizing your new, fancy customer lifecycle is to add your new stages to the RCM. You could create a new RCM just for Customer Marketing, but in order to do that, you’ll need to fork over some additional cash to Marketo (it’s an upgrade) and you’ll have to keep people in and out of both models correctly. This is not only programmatically challenging; it’s also nearly impossible to do accurately. Plus, the reporting can be a nightmare. 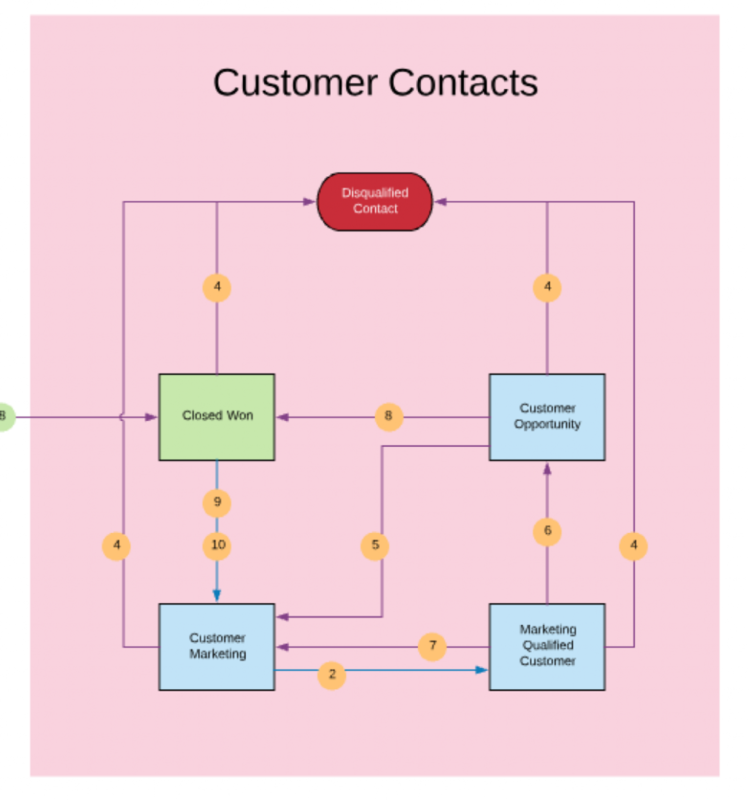 I suggest simply adding the customer lifecycle stages to your existing lead flow model. Note: Leave your model in draft mode. DO NOT ACTIVATE. Again, if you have questions on what this is or how to leverage it, refer to Kim’s post. Assuming you have a lifecycle program built, I recommend creating a folder titled “Customer Marketing” within your campaigns folder. This will help differentiate these stages from your regular demand gen stages. In that folder, create your trigger-based campaigns, aligning the triggers to the transition rules you identified in your Lucid Chart diagram and built into your RCM. Once you’ve created these new stages, do yourself and everyone in your organization a favor and QA your work. Yes. You have to QA before activating. We can’t just launch this thing. Okay, we can, but that’s how marketing automation managers get fired. So, don’t be sloppy. Pro Tip: Create a User Acceptance Testing (UAT) document before operationalizing. We have a template available for this here. Why construct UAT scenarios before testing? Well, it’s grade school stuff. Remember the scientific method? Just like when you did research in science class, each testing scenario and expected outcome acts as a mini hypothesis and research. If you simply test scenarios, it’s much more challenging to deduce what’s broken, because the outcome you receive somehow will manage to be what you expected, if you don’t keep yourself honest. In order to QA, we first have to put some “training wheels” on your new lifecycle and RCM stages. By “training wheels”, I mean you add a filter for “Email Address = yourname@yourcompany.com”. Then, when you create test records, only your tests will trigger your new campaigns. Once you have training wheels on your campaigns, it’s time to activate everything! After activation, use your handy UAT document to meticulously review how campaigns react. Are you receiving the emails you should? Are the correct people in your organization receiving alerts about the activity? Go through each expected behavior with the sort of attention to detail that would make Rainman proud. Rarely can someone build a process out perfectly the first time. Even our team of experts miss a detail here or there. Again, that’s what the QA step is for. Once you identify areas of issue, you may be able to simply fix them in the system. Or, the issue might actually be an unforeseen snag in the process itself. Many times, QA helps identify exception cases that we didn’t predict or discuss in our discovery sessions. Fear not! This is your opportunity to go back to the larger group and solution for them. Once you’ve tested everything, it’s time to notify the original project team about your launch plan. If the operational pieces are accompanied by new workflows for people, be sure that training has happened or will happen in coordination with your launch. The last thing you want is to build triggers off of a manually entered data value that no one is actually entering! Much of where these types of projects fail is right here in this step. A process like this requires orchestration. If you own that orchestration, it’s the type of project you can put on any resume and impress people. In coordination with your launch plan, you’ll want to give yourself a full day before the official launch to batch people into the appropriate spots. Keep in mind, you’re likely dealing with unstructured data from prior to outlining this process. You need to assign people to the correct category. For example, churned customers (those customers who did not renew with you) versus existing customers. Prior to an explicit definition, these are all likely “stuck” in the “Customer” bucket. Once you’ve officially launched, you might think you’re beyond QA. Wrong! We deem the first few weeks of a new, live process as merely a broadening of your QA circle. Most commonly we’ll go back to the same group of people we’ve already involved in the project and ask for their diligence. Go back to your CSMs and encourage them to leverage the process. Tell them to alert you immediately if the expected behavior isn’t what they’re seeing. Keep in mind that your co-workers are likely happy to help you with your project, but they must feel their opinions and time is being well-spent. If they alert you to an issue, be grateful, be open and ensure you fix it quickly. Also, even if you tell them to alert you, even if their boss is behind you 100%, know that this additional “thing” might just slip away from them. You might not be top of mind for them. So, plan to proactively reach out to them one-on-one. One of LeadMD’s core values is to have fun. People are more likely to help you if you make it fun. And so, consider the various ways you can make participation in this initiative fun. Whether you host your discovery sessions over a meal or gamify feedback. Think about ways you can make your project stand out by doing what amounts to an internal marketing campaign for it. I bet you thought we were done, right? Nope. This is actually my favorite part of the process. This is where we get to see the results of all our hard work. Expect to monitor your new Lifecycle and RCM on a weekly basis for the first month. Look for people moving stages unexpectedly, or people getting stuck where they shouldn’t. You can do this in whatever system you choose to operationalize within. This report gives you the opportunity to quickly monitor the flow of people through your lifecycle. It also provides visibility into areas of optimization. For example: In the above report, we really need to work on our “Other” source definitions and assignment! You can also leverage Revenue Cycle Explorer (RCE) to report on your RCM. This will give you things like conversion rates, velocity, average age, and other leading indicators. I recommend creating versions of these reports that are specific to Customer Marketing. Check these reports often during the first month. With all the investment of human capital and systems to make this project hum, it won’t be long before your boss or your boss’s boss asks the question: Is it working? What’s the ROI of this project? I always recommend setting clear expectations at the start. The investment in this process facilitates our ability to create a baseline. If, at the start of the project, we don’t know who owns the customer at key points or how those points add value, then how do we know if it’s “working”? The point of this exercise is to create consistency and measures. At the very least, you should set the expectation that you need the number of days on average upsell/cross-sell opportunities take to close. If you don’t have this data, draw a line in the sand at six months. Ultimately, we have to make sure customers have enough time to get through a full customer marketing/sales process before we can start trying to analyze the reports. Between the time you activate/batch and a full customer marketing/sales process, these reports are used solely for troubleshooting and QA. Congratulations! You now have a fully operationalized Customer Marketing Lifecycle. With this in place, you can track customers’ movements through the stages, but more importantly optimize those touchpoints. Say you’re getting a lot of complaints from your new customers about the amount of time between signing their contract and having their first onboarding session. With this process operationalized, you can quickly pull the data which confirms customers spend on average ten days in limbo. Perhaps that’s well within your communicated SLA, but your team might then decide to send a quick email touchpoint two days after signature with links to helpful onboarding tools, to keep communication going. Your team can then measure the effectiveness of that additional touchpoint on customer happiness. And therein lies the beauty of this process. Discover, build, report and optimize should be the goal for any process implementation. 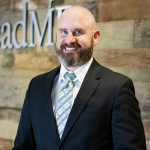 Drew brings more than a decade of marketing experience to LeadMD. He has led strategy in many different disciplines of marketing such as event marketing, product marketing, sponsorship, email, digital and website, marketing analytics and database management. With experience in both B2B and B2C environments, Drew is a well-rounded marketer with a tool for most applications. Drew thrives when he’s using his analytical skills to troubleshoot complex problems or identify areas of improvement. His favorite business quote comes from the movie “Tommy Boy”: “If you aren’t growing, you’re dying. There’s no third direction." Drew joined the LeadMD team in September 2015. When he isn’t working, you can find him captaining his kickball team, playing flag football, participating in obstacle course races and fun runs, or hiking the mountains of Phoenix, AZ with his dog, Sparky.